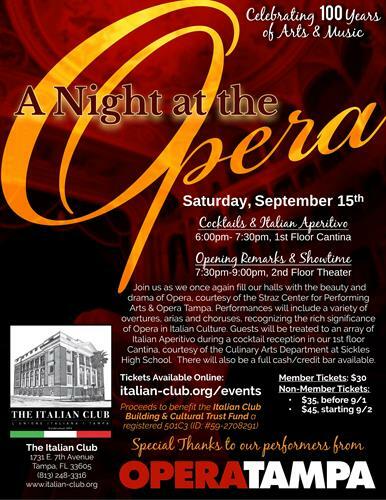 Join us as we once again fill our halls with the beauty and drama of Opera, courtesy of the Straz Center for Performing Arts & Opera Tampa. Performances will include a variety of overtures, arias and choruses, recognizing the rich significance of Opera in Italian Culture. Guests will be treated to an array of Italian Aperitivo during a cocktail reception in our 1st floor Cantina starting at 6:00pm, courtesy of the Culinary Arts Department at Sickles High School. There will also be a full cash/credit bar available. Opening remarks will begin at 7:30pm in the 2nd Floor Theater, followed by the performances. Seating will be open format, so no assigned seating.